After the GSPC officially merged with al-Qa’ida (AQ) in September 2006 the organization became known as al-Qa’ida in the Islamic Maghreb (AQIM). The GSPC, one of the most notorious terrorist groups in North Africa, aligned with Al Qa ida and changed its name. Since 2011, dissident groups of AQIM members broke away to form Movement for Unity and Jihad in West Africa (MUJAO) and al-Mulathamun Battalion and its subordinate unit al-Muwaqi‘un Bil-Dima (“Those Who Sign With Blood”) led by former AQIM battalion leader Mokhtar Belmokhtar. In August 2013 these groups merged to form al-Murabitun, (“The Sentinels”), and officially formalized the groups’ ties; their stated goals are to “unite all Muslims from the Nile to the Atlantic in jihad against Westerners” and to curb French influence in the region. The GSPC/al Qaeda in Islamic Maghreb claimed to be a self-proclaimed pragmatic umbrella organization on both sides of the Mediterranean Sea. Its own use of violence is based on traditional historical, geographical, and cultural reasons. But mixing old and new, local and global, the group is certainly at a turning point. For these reasons, it may be considered as a “glocal” group, a hybrid structure that weds both the local specifics and goals, to create a Maghrebian caliphate, and global operational methods. In the point of view of the comprehension of jihadi groups, this approach of both local and global has in all cases numerous advantages: this permits one to avoid the syndrome of labeling what are often local and specific attacks as simply “al Qaeda.” On the other hand, it also refocuses on the specificity of local violence and individuals. This “glocal” approach may deserve examination of other jihad groups. Observers have highlighted the transformation of the Algerian Salafist Group for Preaching and Combat (known by its French name, Groupe Salatiste pour la predication et le combat--GSPC) into al-Qaeda in Islamic Maghreb. Although research has concluded that the al Qaeda in Islamic Maghreb is a manifestation of the continuing strength of Osama bin Laden’s global organization, it current research on terrorist groups has sometimes neglected to analyze this double phenomenon of global and local roots. By mid-2013 growing lawlessness in southern Libya and an influx of Islamist militants from Mali stoked worries that Libya’s security weaknesses were fast becoming a destabilizing factor in the region. Many al-Qaida-linked jihadists driven out of Mali by a French-led offensive earlier in the year set up at least three jihadist camps in southern Libya. As a consequence, Libya had become the headquarters for al-Qaida in the Islamic Maghreb. The Islamic extremist group Al-Qaeda in the Land of the Islamic Maghreb (AQIM) has been designated as a terrorist organization by both the United States and the European Union. AQIM has declared its intention to attack Western targets throughout the Sahel (including Mali, Mauritania, and Niger). No single group is responsible for supporting Al-Qa'ida in the Islamic Maghreb (AQIM) cells in the region, but noted that AQIM could not survive in the desert without support from local lifelines in the form of food, fuel and arms. AQIM factions in the northern Sahel (northern Mali, Niger, and Mauritania) conducted kidnap for ransom operations and conducted small scale attacks and ambushes on security forces. The targets for kidnap for ransom are usually Western citizens from governments or third parties that have established a pattern of making concessions in the form of ransom payments or the release of operatives in custody. 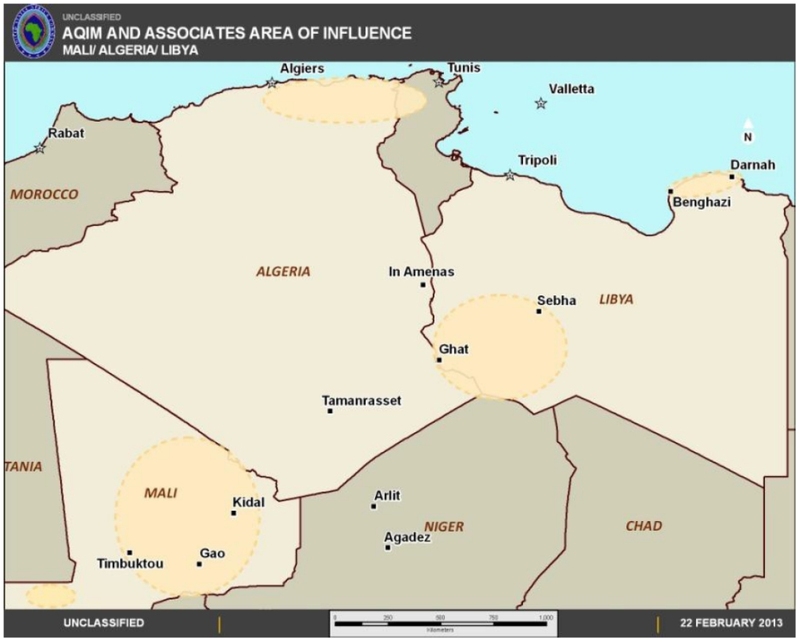 AQIM remains largely a regionally-focused terrorist group. It has adopted a more anti-Western rhetoric and ideology and has aspirations of overthrowing “apostate” African regimes and creating an Islamic Caliphate. AQIM numbers under a thousand fighters and is significantly constrained by its poor finances and lack of broad general appeal in the region. Abdelmalek Droukdel, aka Abu Mus’ab Abd al-Wadoud, is the leader of the group. Isolated portions of northern Mali continue to serve as a safe haven for AQIM, an Algerian-origin terrorist organization formerly known as the Salafist Group for Preaching and Combat (GSPC). The continued presence of AQIM and other armed groups in northern Mali present significant potential danger to travelers. In 2007, AQIM bombed the UN building and an Algerian government building just outside of Algiers killing over 60 people. In 2008 and 2009, even as it was under significant pressure by Algerian security forces, AQIM continued to conduct small scale attacks and ambushes in northeastern Algeria against Algerian security forces and regularly used improvised explosive devices there. In January 2008, a group of assailants who may have been linked to AQIM robbed some Italian aid workers near Araouane north of Timbuktu. In October 2008, in northern Mali, AQIM released two Austrian tourists who had been captured eight months earlier in Tunisia. In February 2009, AQIM claimed responsibility for the December 2008 and January 2009 kidnappings, respectively, of two Canadian-citizen United Nations officials and four European tourists along the Mali-Niger border. AQIM has claimed responsibility for the kidnapping of two Canadian United Nations officials in Niger in December 2008, the kidnapping of four European tourists in January 2009 on the Mali-Niger border, the murder of a British hostage in Mali in June 2009, the murder of a U.S. citizen in Mauritania in June 2009, and the suicide-bombing of the French Embassy in Mauritania on August 8, 2009. On November 14, 2009, heavily armed individuals attempted to kidnap U.S. Embassy employees in Tahoua, Niger. In November 2009, AQIM kidnapped three Spanish citizens in Mauritania. Also in November 2009, AQIM attempted to kidnap USG employees in Niger. In December 2009, AQIM kidnapped an Italian citizen and his wife and a French citizen NGO worker in Mali. On July 24, 2010, AQIM executed the French citizen NGO worker. During 2010 the terrorist organization AQIM killed persons and took hostages. On April 19, in Niger, bandits abducted French citizen Michel Germaneau and later handed him over to AQIM. On July 25, AQIM claimed it had executed Germaneau in reprisal for a French-supported Mauritanian attack on AQIM camps in Mali on July 22, although reportedly Germaneau may already have died by the time of the July 22 raid. On September 17, elements believed to be part of AQIM abducted seven employees--five French, one Togolese, and one Malagasy--of the French firms Areva and Satom in Arlit, Niger, and transported them to AQIM camps in northern Mali. On 23 February 2010, AQIM released French citizen Pierre Camatte who was taken hostage in Menaka in November 2009. The release occurred after courts tried and sentenced to "time served" four AQIM operatives authorities had taken into custody in April 2009. There were developments in the case of three Spanish aid workers kidnapped in Mauritania in November 2009 and held in northern Mali by AQIM. On March 10, AQIM released Alicia Gamez. The remaining two Spanish hostages, Albert Vilalta and Roque Pascual, were released on August 22. According to media reports, the release was in exchange for ransom payments as well as the release by Mauritanian authorities of Malian AQIM member Omar Oul Sid Ahmed Ould Mama, also known as Omar the Sahroui. On April 16, AQIM released two Italian citizens, Sergio Cicala and his wife Philomene Kaboure, who had been held hostage in Mali since their kidnapping in December 2009 in Mauritania. In June 2010, an AQIM attack resulted in the death of 11 Algerian soldiers and the kidnapping of a customs official who was later executed by the organization. Also in June, AQIM was responsible for a detonation of a vehicle-borne improvised explosive device (VBIED) at a police checkpoint, which resulted in the death of seven national police officers and three civilians. In Niger, the group conducted its first vehicle-borne suicide attack in March and in August used similar tactics in an attack on a Mauritanian military base. In total, AQIM attacks in Algeria, Mali, Mauritania, and Niger resulted in the deaths of over 80 people in 2010. In April 2010, AQIM kidnapped French aid worker Michel Germaneau in Niger, later moving him to Mali. In July, Germaneau was killed in retaliation for the death of six AQIM operatives during a failed attempt by France and Mauritania to free him. In September, AQIM claimed responsibility for the kidnapping of seven people, including five French nationals working at a mine in Niger. At year’s end, the hostages had not been released. On January 4, 2011, an individual who had received training in AQIM camps in the north of Mali attacked the French Embassy, causing only minor injuries. On January 7, 2011, AQIM kidnapped and subsequently killed two French nationals from Niamey along the Mali-Niger border in their efforts to elude their pursuers. On November 24, 2011, two French nationals were kidnapped from the town of Hombori, in eastern Mali. On November, 25, 2011, a German national was killed, and a Dutch, a South African, and a Swedish national were kidnapped in Timbuktu. Mauritania, Algeria, and Niger have all been given authorization to pursue terrorist or criminal elements crossing their borders into Mali. With the exception of French hostage Pierre Camatte, all of the hostages purported to be held in Northern Mali were kidnapped in other countries, some from very far afield. And yet, once the hostages disappear these other countries simply assert that they have been taken to Northern Mali and wash their hands of all efforts to gain their liberty. 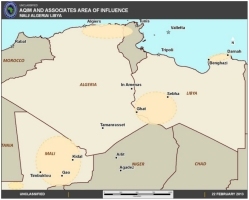 By 2011 AQIM had under a thousand fighters operating in Algeria with a smaller number in the Sahel. It operates in Northeastern Algeria (including but not limited to the Kabylie region) and northern Mali, Niger, and Mauritania. Algerian expatriates and AQIM members abroad, many residing in Western Europe, provide limited financial and logistical support. AQIM members engage in hostage-taking for ransom and criminal activity to finance their operations. On 20 November 2015 militants took 170 captives a the Radisson Blu hotel in Bamako, the capital of Mali. At least five gunmen [and as many as ten originally reported] stormed the hotel shouting "Allahu Akbar" (God is greatest) with guns and grenades. The gunmen released hostages who were able to recite the Quran. The US military's Africa Command said the rescued hostages include six US citizens. It said US military personnel were helping outside the hotel. According to UN peacekeepers, 27 bodies had been found at the Mali hotel [including two attackers]. Veteran militant leader Mokhtar Belmokhtar's group Al Mourabitoun staged the attack months after he was reported killed in an air strike. Two Islamist militant groups, al Mourabitoun [The Sentinels] and al Qaeda in the Islamic Maghreb (AQIM), claimed responsibility for the deadly attack, according to Mauritania's Alakhbar news agency. A US defense official called AQIM the "leading suspect" in the assault. The siege of an upscale hotel that killed at least 23 people in the capital, Ouagadougou, ended 16 January 2016. Interior Minister Simon Campaore said that the victims from 18 countries died in the attack at the Splendid Hotel, adding that more than 150 hostages were rescued in a security operation but a number of them were wounded. Campaore said that three militant jihadists were killed in the attack, two women and one man. Government troops, along with their French counterparts, battled the militants to retake the luxury hotel popular with foreigners and UN staff. The deadly terror attack in Ivory Coast 13 March 2016 was the latest in a recent string of high-profile attacks in previously untouched parts of West Africa. The attacks had all been claimed by the same group, al-Qaida in the Islamic Maghreb, which not only appears to be bouncing back after the 2013 regional military intervention in Mali but also shifting strategy. This was definitely not their first attempt in Ivory Coast. He says Abidjan authorities said they stopped one operation several months earlier. As long as AQIM has allies all over the region, it’s easy for them to conduct these seemingly sophisticated attacks far from their base in northern Mali and the border with Algeria. Algeria made impressive gains against both the Salafist Group for Call and Combat (GSPC - also known as the Salafist Group for Preaching and Combat) and the Armed Islamic Group (GIA). In June, GSPC "Emir" Nabil Sahraoui (aka Abu Ibrahim Mustapha) was killed by security forces during an armed clash. In October, Amari Saifi, a.k.a. Abderazak al-Para, the GSPC leader responsible for the 2003 kidnapping of 32 European hostages in Algeria, was apprehended through cooperation with the Chadian and Libyan authorities, and returned to Algeria after being held by a Chadian rebel group, the Movement for Democracy and Justice, for several months. In early November, Algerian security forces captured GIA leader Nouredine Boudiaf and three of his associates along with a large cache of weapons near the Algiers airport. Algerian authorities arrested more than 400 other GSPC and GIA terrorists during 2004. According to Algerian authorities, fewer than 800 terrorists remain active in Algeria, down from a possible high of 28,000 terrorists in the mid-1990s. The Government's success in capturing or killing a number of GSPC and GIA leaders has further weakened the effectiveness of these two groups. The GSPC, however, carried out several operations in Algeria in 2004, including the August ambush of a military convoy in which 40 members of the security forces were killed. On June 21, GSPC terrorists exploded a vehicle-borne explosive device outside the El-Hamma electric power generating facility in central Algiers, causing no casualties but knocking out 210 MW of generating capacity for several months. Members of the cell responsible for the El-Hamma bombing were reportedly killed by security forces in October. Numerous smaller incidents occurred in 2004, mainly in the Boumerdes area and in parts of Kabylie. On 04 June 2005, members of the Sahel faction of the Salafist Group for Preaching and Combat (GSPC) attacked the remote Mauritanian military outpost at el-Mreiti, killing at least 15 Mauritanian soldiers and wounding at least an equal number. The Mauritanian Government launched military operations, in cooperation with Algeria and Mali, against the GSPC terrorists. Those operations resulted in several clashes with the GSPC and inflicted an unknown number of casualties on the terrorist organization. Members of the GSPC continued to operate in the Sahel region, crossing difficult-to-patrol borders between Mali, Mauritania, Niger, Algeria, and Chad to recruit extremists within the region for training and terrorist operations in the Trans-Sahara, and possibly for operations outside the region. With the help of USG-funded training, these countries have increasingly cooperated against the GSPC. The Salafist Group for Preaching and Combat (GSPC) in 2006 merged with al-Qa'ida to form al-Qa'ida in the Lands of the Islamic Maghreb, which has launched an ongoing series of kidnappings and bombings targeting the Algerian Government and Western interests. On April 10, 2007, the new organization claimed credit for two suicide car bomb attacks in Algiers that killed 23 people. Some observers have speculated that North Africa may be the next safe haven for al Qa ida, and that European countries may face a greater risk of attack if Algerian terrorist groups expand their base of support in Europe. The alignment of the GSPC with al Qa ida represents a significant change in the group's strategy, however, its decision to join al Qa ida's global jihad should be understood as an act of desperation. On February 20, 2008, the Department of State amended the GSPC designation to reflect the change and made AQIM the official name for the organization. Some senior members of AQIM are former Armed Islamic Group (GIA) insurgents.